First trip report here, so be please be patient with me. Feedback is appreciated. I'm preparing for a multi-day hike in mid-late July and wanted to get accustomed to writing a trip report. I've really enjoyed others reports so I decided now is the time to write my own. My wife and I did a little day-hiking and car-camping this past weekend at Trough Creek State Park (PA), near the popular Raystown Lake. 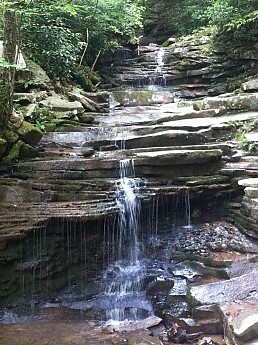 Trough Creek SP is surrounded by Rothrock State Forest and the Raystown Lake Rec Area, so there are a number of nice trials to hike while everyone else is out on the lake. In all we hiked about eight miles - two on Friday night to a lookout and get a sense for the trail conditions and six more on Saturday before the heat and humidity got too bad. 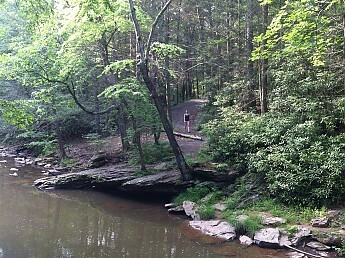 The best trail for overall enjoyment was the Brumbaugh Trail, which took us from Rainbow Falls Bridge to Balanced Rock, up and over some of the ridges and through a variety of forest settings. Supposedly this trial offers a nice view of the lake below but I suspect the view is only available when the leaves aren't on the trees. We never saw such view. 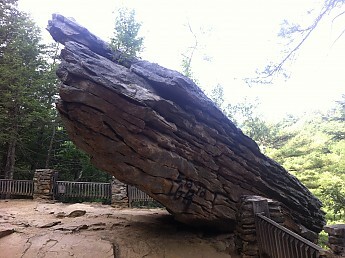 Balanced Rock, which is accessed via some lovely CCC-built stone steps that make up the short Balanced Rock Trail from the Rainbow Falls bridge. Unfortunately, because of its easy access there is some unsightly graffiti on the rock. My lovely wife waited while I ran ahead and crossed the bridge over Great Trough Creek so I could snag this shot of her. 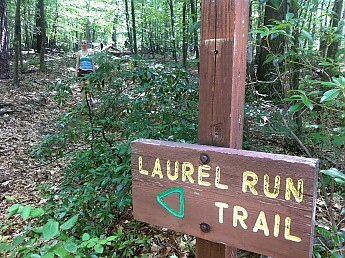 The most scenic trail was the Laurel Run Trail which criss-crosses its namesake water feature. A cool and shaded trail with scenic views of the rocky outcrops above. This was the area that locals say Edgar Allan Poe got his inspiration for "The Raven." Supposedly ravens use or used these rocky outcrops for their nesting sites and one of the trails is even named Raven Rock Trail. Who knows the validity of such legend as I suspect there are numerous places that make the same claim. The trail was great nonetheless. This was the most scenic of all trails, although this was probably the only well marked trail marker and as you can see, there is a sign missing from the post. 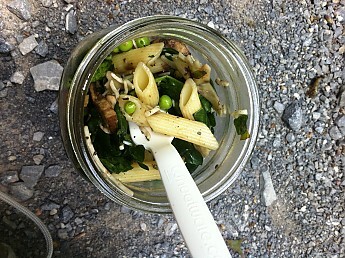 When day-hiking it's okay to bring really heavy glass containers full of pasta, veggies, cheese and mushrooms. One tightly packed wide-mouth quart jar was plenty for the two of us. The rhododendron was just beginning to bloom. Another couple weeks and these trails will be full of color from the wild rhododendron. 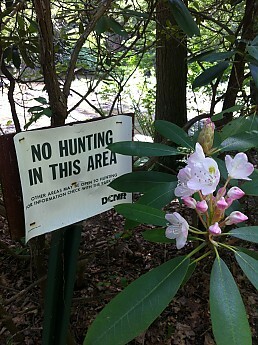 There is a window in mid-late June after the mountain laurel blooms and before the rhododendron blooms that there are few colors in the woods other than green. Unfortunately, that was our window to hike. The highlight for us was seeing a momma black bear and her cub fairly up close, although my wife says it was maybe a little closer than than she would have liked. The trail was making a long uphill right-hand bend near the top of a densely-covered ridge - lots of ground cover and a thick canopy. Not many leaves on the ground this time of year, so our steps were fairly quiet. We came around the bend and suddenly no more than 20 yards away the mother bear, who was only 10 feet off the trail turned quickly to look at us. It was pretty clear that she was surprised to see us. She remained on all fours, never bluffed us, but had no interest in leaving the area. We made some noise, but she didn't move. I saw she had a cub rustling in the thick brush close to her right next to the trail. It was thick enough vegetation that I wasn't sure if she had another cub elsewhere. Between that and the fact that she wasn't moving after we made some noise, we decided it would be best to leave the area the way we came. Didn't think to grab the camera and snag a photo. This was my wife's first bear encounter and after her heart rate came back to normal levels she admitted that it was a pretty cool experience. I hadn't seen a bear since 2011, so it was a nice reminder that we share the woods with some incredible creatures. Thanks for reading and looking forward to reading your trip reports. Nice report, thanks for sharing. I noticed in a couple of places you spelled "trail" as "trial" (I do the same thing all the time); and it made me laugh. Did he mean "trail' or did he mean "trial" sometimes they are the same thing; maybe there is a reason they are spelled similarly. Also, the pasta, veggies, cheese, and mushrooms looks great! Wonder if it would dehydrate well? Thanks again for the report. No worries, a trip report is whatever you want to make it! This is a fine report! Personally, I love sharing reports and read them all. I agree with MPaint, that pasta veggie mix looks top-shelf to me. Nice hike report. The balanced rock makes me think of the petrified trees in Arizona. Great report! I love pasta! I only have experience dehydrating venison (for jerky) and fruit, so I don't know how well a meal like this would dehydrate. It was delicious though. Fresh peas and spinach from the garden was great on the trail. Something we'll definitely be taking again on day-hikes.